Leave a Comment on #30DaysOfBiking, Day 5: Some Days You Just Check the Box. It Still Counts. Fridays are a good day for me to telework. I seldom have work meetings and if I do they tend to be conference calls. I can hunker down at the computer and put in a long concentrated block of work, gaining over 1-1/2 hours of time I’d otherwise be pedaling to and from the office (longer than that, if I have to drive to Olympia for meetings). This of course means I have to plan to get in a bike ride. I sent an invitation to a friend to meet up for coffee sometime mid-afternoon when I thought we could both use a brain break and a java jolt. Turned out she was in Oregon. That would be quite a ride. Change of plans, then. I could put in a grocery store run either at lunch or at the end of the day. I thought, I typed, I tried not to look at the inbox so I could maintain my concentration. The sky outside looked a little gray but what’s a little gray? This is Seattle. Lots of days are rainy but not actually raining. Turned out this was not one of those days. At some point I was startled out of my deep work by the crashing sound that proved to be a monsoon’s worth of rain pounding our back deck, joined in no time by flashes of lightning. Okay, so, I might have had to cancel that coffee date anyway. Hey, you never know, it might all blow away and then I could go for groceries instead. It happens. But you have to be watching for those holes in the cloud cover. I didn’t. By the time I noticed that there was actually a little blue sky showing I still had some work I needed to finish. I should have known better. Wrapped up that project, looked outside, the blue was gone and the treetops were flipping wildly back and forth in a strong wind bringing more clouds my way. And while Zelda the e-bike does defy the wind, I’m officially three weeks into a respiratory virus with no sign of the cough ever, ever leaving my chest. Deliberately setting out to get cold and damp sounded like . . . not the brightest idea I’d ever had. Plan C it was. 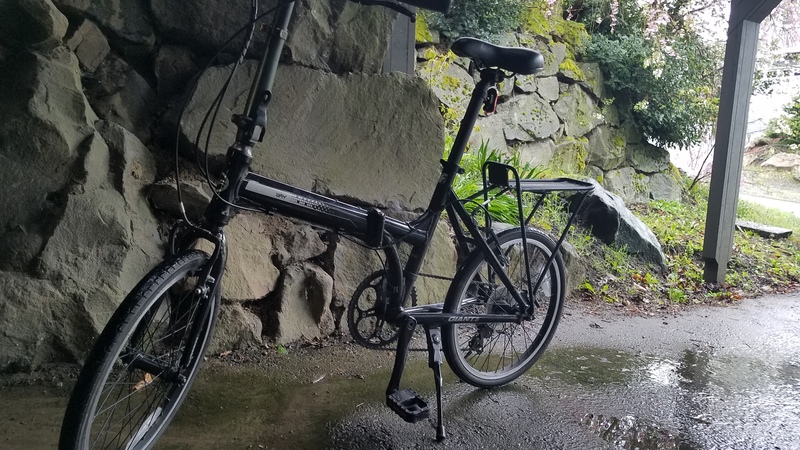 I pulled Tessa the folding bike out just for a change of pace. Not that you get up much of a pace when all you do is ride your Tiny Clown Bike in a Tiny Clown Circle in your driveway. We have a front deck that protects the entrance to the garage and I almost stayed just inside that protected space, although the rain was getting through there too. I did technically leave the driveway and go up the street about five yards so I could turn a circle in the neighbor’s driveway and coast back down into ours. The beauty of 30 Days of Biking is that this totally, totally counts. After all, I thought yesterday about how to get in a bike ride today. When that fell through, I came up with a second option. When the weather took all the joy out of a longer ride, I did at least still turn the pedals a few times. That’s what it’s all about. Seriously. Our back deck during a slight pause in the buckets of water falling from the sky. At least I didn’t need to water the garden today. Even with the work Sweet Hubs did to put a cover underneath the deck to route water off into the plantings on either side, some of the wet stuff still gets through.